This nail is proof that Lean works. We own an old house – like an “it’s so old no one really knows how old it really is so the deed says built in 1900” kind of old. My guess is it’s circa 1850-1875, judging by some of the evidence I’ve found and seen. Like this nail. 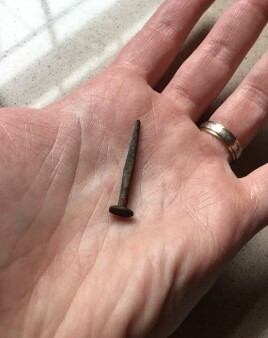 For those who aren’t home improvement or historical house aficionados, the head shape and shank cross-section of this nail suggest the timeframe above. An impressive lifespan for sure, but perhaps more impressive is what this nail signifies on the evolution of Lean thinking and adoption. Somewhere prior to 200 years ago, a blacksmith would stand at a furnace, heating small bits of metal until they were red hot. He’d then hammer those bits into nail shapes on an anvil. Once he was happy with the relative size and shape, he’d quench the nail in a bucket of water. Then he made another one, and another, and another. As a craftsman, I can admire and respect the time and patience it took to make nails in this manner. As a Lean practitioner, it hurts my brain to even think about. How cumbersome must that have been, toiling away in front of a fire, hammering metal into shape over and over, day after day… certainly not for the faint of heart or short of attention span. But a necessary and vital part of building houses for a blossoming new nation. Enter the Industrial Revolution. Fresh off our victory to gain independence, we forged new territories and sought to put down roots for our families. In short order, making nails one by one wasn’t cutting it anymore. In the early 1800’s, machines were designed and built that could semi-automate the making of nails. That’s how this particular nail was made, judging by its witness marks (which are still visible thanks to having been used in an interior wall). Automation isn’t a tenet of Lean per se, but meeting customer demand (takt time) certainly is, along with standardization. Imagine how different each hand-made nail must have been – each slightly longer or shorter, skinnier or fatter than the next. Truly, early nails were snowflakes amongst hardware. This nail is nothing special in its work. It held up what is called lath – thin strips of wood that were nailed to wall studs. 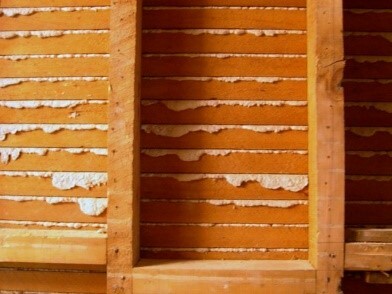 Lath’s sole purpose was to provide a framework – a skeleton if you will – for the horse-hair plaster that would eventually be applied to form the wall surface. Like nail manufacturing, plastering was painstakingly slow and demanded a skilled hand. As it was applied, part of the toothpaste-consistency plaster would ooze into the gaps in the lath and then harden, which would serve to hold the plaster to the wall. And just like it sounds – it used horse hair to help bind the plaster and give it internal strength, a predecessor to the way we make fiberglass today. The key in this process is knowing just how hard to push to get the plaster through the gaps, but not so hard that you waste material. Push too lightly, and the hardened plaster (which is quite heavy) will fall right off the wall. This picture shows an example of what it should look like on the backside of the wall. Contrast this with the methods of today, where practically everything you need to build a home can be found in one place. Modern building materials are cheaper, lighter, more consistent and faster to install than those of yesteryear. For instance, today you can buy a 4’x8’ sheet of drywall and screw or nail it directly to wall studs in just a few minutes. No lath, no plaster. A professional crew of 2-3 people can install all the drywall in a 3,000 square-foot home in just a couple days – a feat that would have taken that same crew weeks using the old method. Similarly, drywall can be installed by virtually anyone, without the need of any special tools or training. The same cannot be said for plastering (trust me; I’ve tried it!). Lean is Respect for People, and there’s no place like home that better proves it. Home is the place where we live. The place we always return to, the place we raise our kids and mark their heights on door casings as they grow. It is Thanksgiving dinner and learning to ride a bike. It is curling up on the couch to watch a movie and making snowmen with a real carrot nose. Making that place the best it can be is the most respectful thing I think anyone can do for another person. ← Get your cookies last week? Thank Lean!